South Korea’s top secondary battery maker LG Chem Ltd. on Wednesday picked five foreign startups as the winners of its Battery Challenge, an open innovation contest for startups designed to groom new battery technologies. The five winners – four from the U.S. and one from the U.K. – were chosen among seven shortlisted candidates after giving a presentation on their new technologies and related business plans at LG Science Park in Seoul yesterday, the company said Thursday. 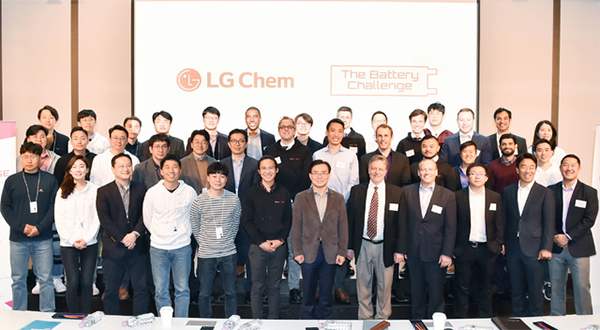 LG Chem initiated the battery startup contest last year to explore and nurture new battery technologies, and total 129 startups from 27 countries joined the contest, it added. The finalists competed each other with lithium-metal battery technologies and new solutions to improve battery performance and manufacturing process. Big data, artificial intelligence and machine learning-backed ideas also were showcased. LG Chem will conduct joint research with the five winners and invest in their stakes worth $2 million in total. The other 124 participants eliminated from the contest will also have an opportunity of partnership with LG Chem for further assessment and investment. LG Chem has been actively seeking open innovation for new technologies to keep its lead in the battery business. Before the latest competition, it selected 12 projects at its Battery Innovation Contest in 2017 to provide financial support and work force.